Holidaying is a grand affair when you’re residing in a place like Villa Rak Tawan. 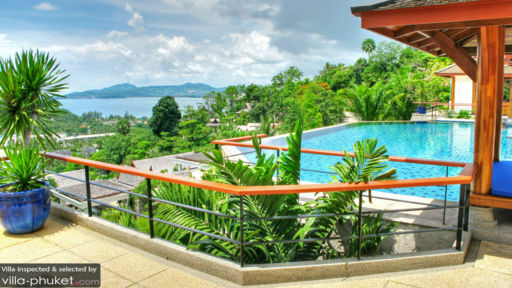 Set upon the hillside of Surin Beach, this well-positioned vacation rental offers stunning views of the island’s scenic coastline and tropical greenery. Very aptly named ‘rak tawan’ (this translates to mean ‘villa of love and sunshines’), this finely-appointed home is one that’s ideal for a relaxing family retreat or fun-filled getaway with friends. You’ll also be placed within close proximity to an array of attractions; the upscale shopping streets, bistros and nightlife spots of Surin are just minutes away from the villa. Six oceanfront bedrooms sleep a total of twelve guests. King beds, air conditioners, generous closet space and roomy en suites are amenities you’ll find in all six bedrooms. Four of the rooms feature a wraparound deck, while a spacious deck (equipped with outdoor furniture) extends out from the fifth bedroom. The sixth bedroom is ideal for accommodating small families; it comes with a double bed settee, a couch, writing desk and library. A vast infinity pool hugs close to the edge of the outdoor compounds. Sparkling under the golden rays of the sun, it beckons invitingly to vacation makers seeking respite from the heat. You’ll enjoy spectacular ocean views and stunning sunsets from the pool, but if you’re in the mood for keeping dry, you’ll find a comfortable seat upon the pillowy outdoor lounges or upon the day beds set under the breezy salas. Contemporary and luxurious are words that best describe the living spaces of Villa Rak Tawan. 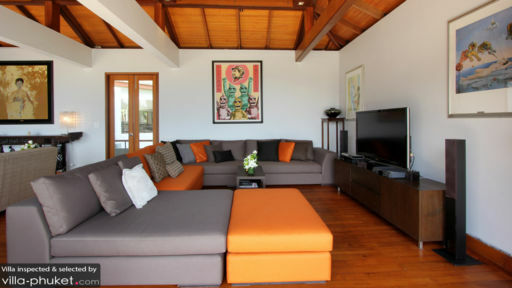 Wood panel flooring, vaulted ceilings, modern furniture and colourful paintings adorn the interiors. The open-plan design of the living areas allow ample wind and sunlight to flood in, creating a setting that is bright and airy all day. An office and miniature library provide a quiet spot for busy holidaymakers to catch up on their work and emails. A well-equipped gym, plush home entertainment room and Bose surround sound system makes working out or throwing social gatherings an easy feat here. Housekeeping services, security service and in-villa massages at Villa Rak Tawan are included with your stay. Amenities available at additional cost include laundry service, child minding services, personal driver service, car rental and airport transfers. 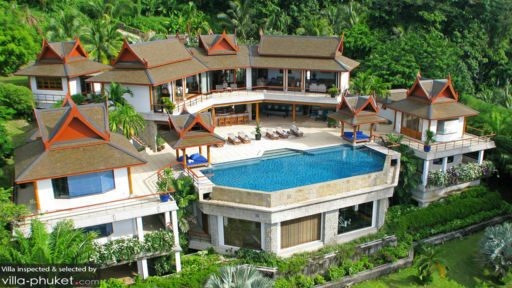 Villa Rak Tawan enjoys a prime hilltop location in Surin, a coastal town in West Phuket. Known as the island’s five star beach, Surin exudes a glamorous, exclusive vibe with its pristine white sand shores, turquoise waters and luxury holiday homes. Spend the day sunbathing at the picture-perfect Surin Beach - a venue that remains popular with beach-goers all year round. While the beach is great for swimming during November till April, strong waves are present between May to October, so exercise caution if you intend to make a splash in the waters. The months of October till April offers excellent snorkeling; the best spot is around the headland at the northern end of the coast. Enjoy incredible in-villa dining experiences at Rak Tawan, or try out fine dining establishments in the vicinity. Venues that come with our recommendations include Italian restaurant Bocconcino Deli, French-Asian fusion venue DeDos LeLounge and Silk Restaurant and Bar, where you’ll find some of the tastiest plates of Thai fare in town. The island’s must-sees include the iconic Big Buddha, Wat Chalong and Promthep Cape. Radar Hill Viewpoint offers magnificent views and a peaceful setting free from the crowds. A stroll through the streets of Old Phuket Town is recommended; you’ll take in the stunning architecture of well-preserved Sino-Portuguese buildings and chance upon myriad boutiques, restaurants and cafes. The food was great and I will recommend Villa Rak Tawan to everybody who comes to Phuket. I have had the best time ever! We enjoy spending our time at the villa even more than anywhere else on the island! The views were outstanding, paradise. Was truly the most restful and beautiful place. The team was outstanding, like coming home. Thank you for the fabulous week. The food was fantastic and we are looking forward to going home and trying out some new recipes. The staff were also wonderful.